All Images © 2018. Photographer: Daniel Shanken for Stackpole Books. View hi-res. I’ve been looking forward to sharing some sneak peeks! You’re looking at Tunisian crochet eyelets on the diagonal, frilled ? with love knots ?. I used our Lotus yarn in these colors: Carbonite, Pearly Pearl, Satin Grey, and Lustrous Tan. 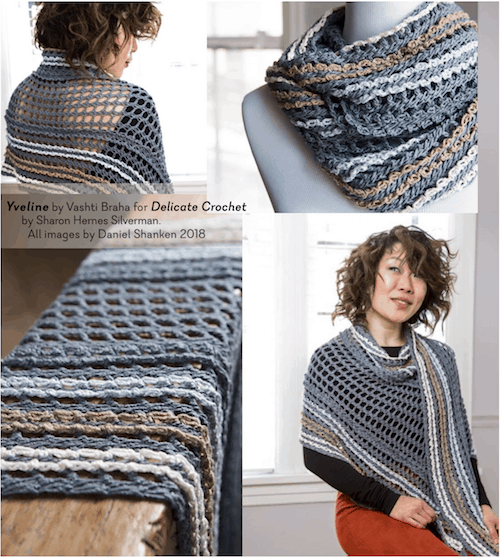 Yveline is one of two new crochet patterns I contributed to a forthcoming book. It’s called Delicate Crochet: 23 Light and Pretty Designs for Shawls, Tops and More by Sharon Hernes Silverman. The book’s official publication date is December 1, but look for it as early as October. I’ll be traveling with Yveline to the CGOA crochet conference in Portland OR next month because she wants to meet everyone who is taking the Tunisian Crochet on the Diagonal class AND 21st Century Love Knot Adventures. If you’re going to the conference and you took one of my earlier Tunisian lace classes, Yveline will want to meet you too. I brought swatches to those earlier classes that have since come of age in the form of the lovely Yveline. First, the name. It started out “Lean In” because that’s what I called the early swatches. It fascinated me how much some Tunisian stitches liked to lean with a little encouragement. Not just how much, but the kind of movement; sometimes it’s like Tunisian lace stitches have hinges or ball joints. When it came time for a grown up name, I was in a dual swoon from binge-watching the Versailles series while adding the love knot frills! I looked for names associated with Versailles and learned that the city is located in a département called Yvelines. A small bag I designed 9 years ago inspired the ruffle idea. Image missing? View it here. It did take several swatches. Remember last year when I did a newsletter on ruffles? It was shortly after I shipped Yveline to Sharon, the book author. I’d been swatching and meditating on the essence of a crocheted ruffle for a few months. The Tunisian eyelet fabric is so airy and “flexy” (another name I gave to the early swatches) that most of the ruffles I tried were too heavy. I love how airy the love knot frills are! Love! The urge to frill has a story too. Years ago I crocheted the cutest little bag. It’s Tunisian simple stitch with ruffles surface-crocheted on it. So that’s my Delicate Crochet story of Yveline. I have a very different story coming up about the other design I did for the book!